Friends i need your help! 😦, originally uploaded by Craftydiddl. So, the carigan i have been avoiding…here it is. I cranked out the rest of the right sleeve yesterday and today started the left. I would have been done tonight. i woudl have conquered my avoidance and had an FO. But do you see that tail of yarn by my needles…that’s all i have left. The yarn was passed on to me a year ago by hubby’s grandma and i don’t know how long before that she had it-so i can’t just go to the store and get more. i do have some of the yarn left over from the stripes but i wasn’t sure how it would look to put that on the cuffs. This may sound revolutionary but that’s what I would do: finish this ONE cuff with the yarn from the stripes. Yes, only this one, leave the other one black. It would create a new interesting design of the cardigan! I would honestly do 3/4 sleeves. If you are really dead set against it then I would do the cuffs in the deeper pink. That would be cute! I like Joanna’s idea. 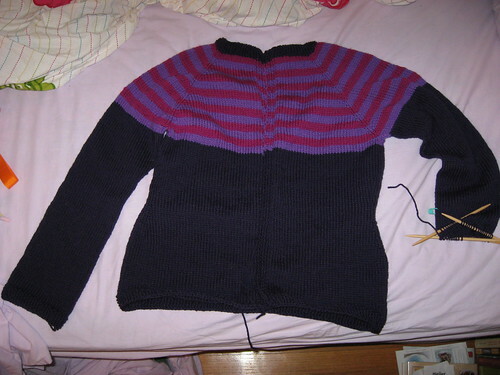 One sleeve of stripes would be visually interesting and go so nicely with the yoke. arrrggghhh, my aolmac did not let me post!! i had to switch to safari. Anyway, I totally side with Stacey – just get over it and do the 3/4 sleeves. Possibly with a short pink or lavendar (prefer) ruffle at the ends. That would be the most elegant solution. Aside from that, mayyyybe the sleeve cuffs in lavendar. Best yet – make the 3/4 sleeves with ruffles as above and since you don’t like 3/4 sleeves, i will humble myself for you instead and wear it ;). Ha! definitely best solution!! !